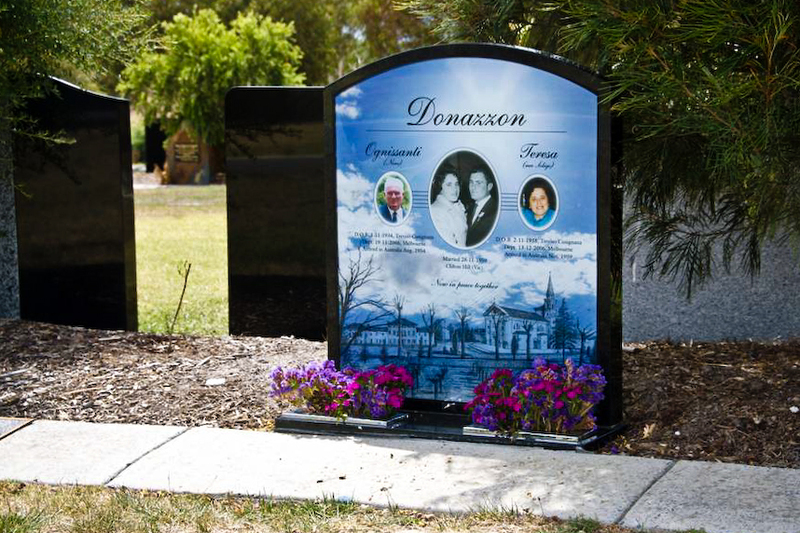 The Life’s Memories Group is a leading supplier of memorials across Australia to both cemeteries and the public. Our memorials are made from local and imported natural stone. Our company is Australian owned and operated. Our team has more than 50 years experience in the stone and memorial industry and can create memorials to suit the needs of clients. We can provide a large range of memorial types to suit any nationality, culture or religion and we also create bespoke memorials for those seeking a unique product. Life’s Memories supply glass memorial plaques which allow an image to be printed into glass using world first patented technology ensuring that the plaques are able to withstand the elements and maintain their colour in the most extreme conditions. Life’s Memories Glass plagues provide families with virtually unlimited scope for working and imagery. Unlike traditional inscriptions or bronze plaques Life’s Memories glass plaques provide a clean color image and allow a combination of photographs, images, words and colors to be used to provide a beautiful tribute to your loved ones. Let us keep in touch via email with all our latest news and information.